As an actively performing pianist, harpsichordist and organist, Paige enjoys playing a wide variety of keyboard instruments. From intimate harpsichord music with chamber orchestra to robust grand choeur French organ literature for festival sacred services, Paige is an experienced keyboardist with a large repertoire of varied keyboard literature. Recently commissioned, Paige’s newest harpsichord is a single manual, Franco-Flemish instrument comprised of two 8’ stops and a buff. Transposable 415/440, the keyboard has a range from GG-d’’’ (57 notes). Built by Adam Decker of Atlanta, GA, this wonderful instrument has tonal brilliance and a beautifully painted Flemish soundboard, with papers and Latin mottos on the interior lid. For the lid flap, the Latin motto reads Soli Deo Gloria which means Glory be to God alone. The longer motto on the interior lid reads Musica laetitiae comes medicina dolorum – Music is the companion of joy and the medicine of sorrow. Also pictured is Paige’s rare and unique pedal harpsichord. Made from Hubbard specs, the pedal instrument is comprised of an 8’ and 16’ stop. The pedal instrument is connected to a standard scale, custom made AGO (American Guild of Organist) pedalboard. The top instrument, comprised of an 8’, 4’ and buff stops, is a Flemish single manual harpsichord. 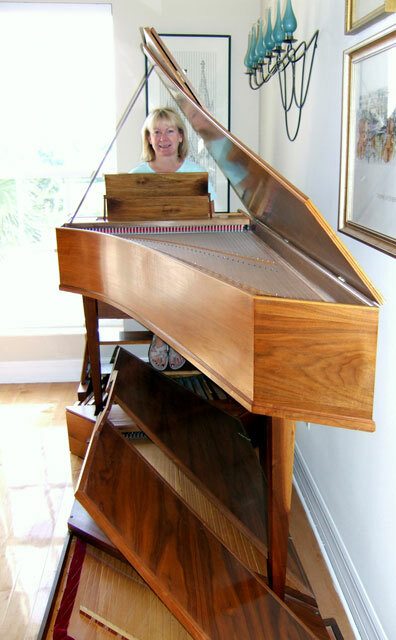 The top harpsichord can be easily removed from the pedal instrument, as it simply sits on top of the pedal instrument. Paige recently sold this harpsichord and its new home will be in a private residence in Atlanta, GA.